Top 20 Best Free Software Download websites to download freewares: – Computer being the most used gadget in the recent years, have increased the need of different types of software for different activities. We need to download a software for some or other reason and hence, software companies come up with different types software every now and then. These softwares are developed by some of the best developers and programmers who design them according to our needs and that are available to download online. However, there are thousands of such softwares available online and to find the right one that suits your needs becomes really difficult. That is when you need the software download sites that help you to identify the one based on your requirement. These sites not only host the software download links 24/7 on their servers, but also place them in a way for you to find the software you are looking for, easily. Also, whenever you download any software from one of these sites, it scans the program that you are downloading and get rids of any malware or viruses. The additional perk is that nearly all the websites have a user community that is active, and hence you can view their feedbacks and reviews as well. Now, there are numerous software download sites from where you can download your desired software, however, many of them need you to register and purchase their premium version and ask for your credit card or PayPal details to proceed further. Some of them even come with spyware and corrupted files which may even escape the scan and therefore, cause damage to your PC. 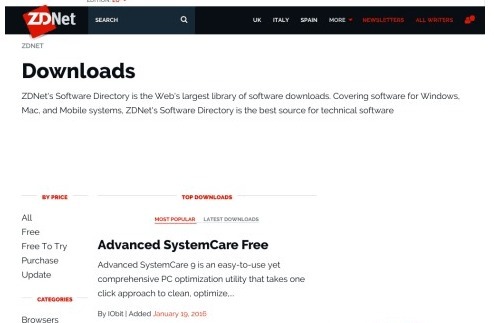 So, today we have come up with a comprehensive list of free software download sites that not only feature a wide range of quality softwares and are safe to download, but are also easy to use..
Cnet Download or Download.com needs no introduction in the category of software downloads. If you are looking for free software download it is the first website that comes into one’s mind. It is an internet directory for software downloads that offers you a comprehensive list of all types of softwares and is also one of the oldest of its kind. It features more than 100,000 free softwares, sharewares and try-first downloads. The downloads are usually rated and reviewed by the editors and contains a brief of the software by the publisher. If you are a registered user even you can write reviews and rate the product. 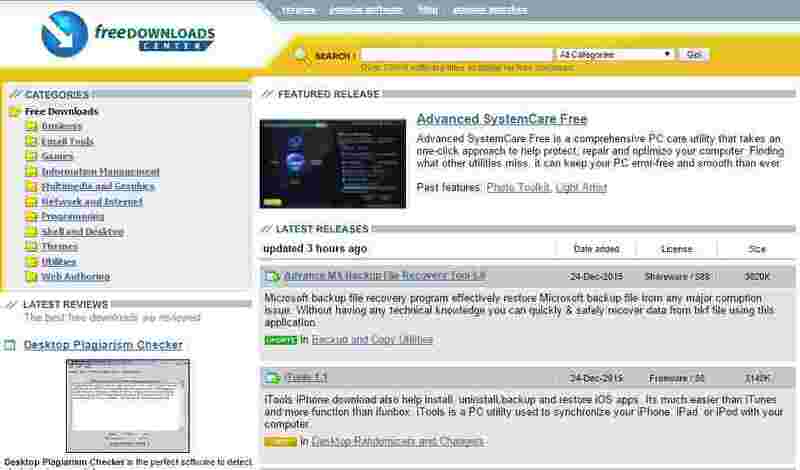 Another popular websites in its category is Softpedia that not only allows you to download your favorite free software, but you can also get more information on the about the software and even reviews. It was launched in 2001 and is more of an online encyclopedia that helps you to look for effective solutions and enables you to download any type of free software. That’s not all, as Softpedia also features the best collection of PC games and wide variety of big and mini games for kids that can be downloaded in minutes. You can also download softwares from an external mirror which is safe enough. Overall, Softpedia is a well-known, credible and secured option to download free software. Launched by Tomas Diago in 1997 it is one of the most popular websites for downloading free software. It provides you a wide choice of softwares and offers you an option to download from mirror. From the two mirror links listed on the site, you need to choose one to download your desired software. The eventual download happens via the Softonic downloader that is quick and safe. The website now has a blog that provides you with all the latest updates in technology. It also features a Question and Answer forum where you can pitch in your queries related to any software or mobile application. Launched in 2002 and one of the most visited websites; Brothersoft offers over 200000 free softwares to download that includes widgets, browsers, utilities, drivers, scripts, mobile applications, wallpapers and video games. Even Brothersoft lets you download your software from its mirror link, one of which is for the U.S. and the other is Global CDN. While you have the option to download the software from the direct download link, for bigger softwares the Brothersoft Downloader needs to be downloaded. If you are a beginner in the software downloading process or even an expert, sourceforge is sure to help you with a wide number of tools. Things are well-arranged on the simple interface that is offered by most of the software files. The detailed information about the software helps you to understand things easily. On the other hand, there are many files that do not make any changes lest you apply them. The quality of the software that is listed for download is checked before even they are posted. Therefore, the website ensures that each program is safe to download with no malware or virus. If you require any help regarding your PC or software issues, you can simply discuss your concern with the SourceForge user community that provides you excellent support. From open source software to freeware and even shareware, Filehippo offers it all. Launched in 2004, it is an online software directory that offers free software for Windows. They also have their own software such as, filehippo update checker that checks your PC for any pre-installed software from the Filehippo website and recommends any latest updates available. Updating your computer software at regular intervals is extremely important and the update checker helps you exactly with that. The website on the other hand has a simple layout that’s easy to understand and navigate, thereby making it easier for you to search softwares and download. 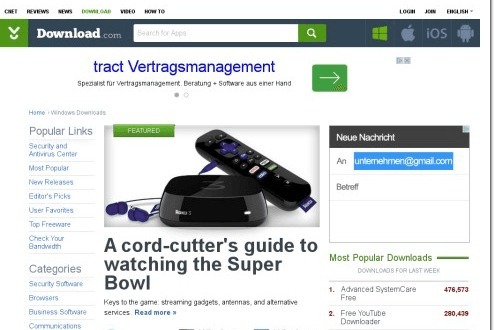 Software Informer is a pretty new website in the league that features a fair number of softwares to meet your download requirements. Even though it is not as big as the other software download sites, but with the top quality of software that they offer and due to the regular updates it’s being counted among the most trusted free software download sites. Moreover, to download apps from Software Informer is extremely safe as it runs a scan through the file for any malware before the download and allows only the ones that are clean. 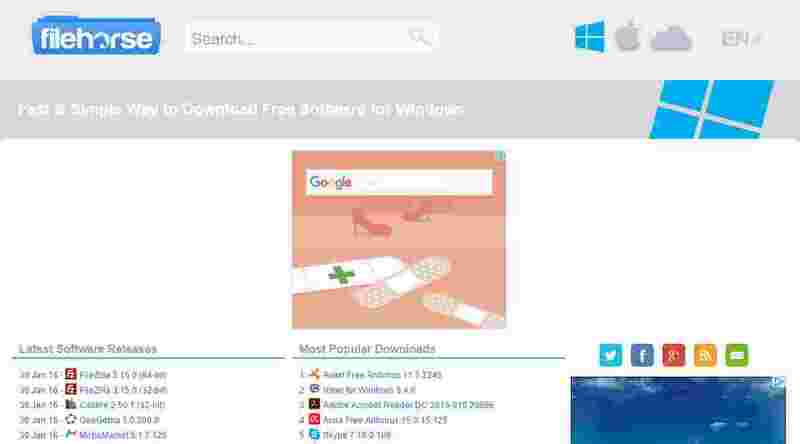 One of the major software downloading websites, Soft32 lets you download even free stuff. The website is well-organized and lists the software programs in an orderly manner for you to be able to search for it easily. It sorts the programs by the type of Operating System that makes it even smoother for you to find and download the desired software. However, the ad pop ups are really distracting. It features around 87587 software programs and provides a Windows discussion forum for any issues related to the Windows OS. It offers software downloads from almost all the categories and the download process is quite fast considering that it happens from their own downloader. 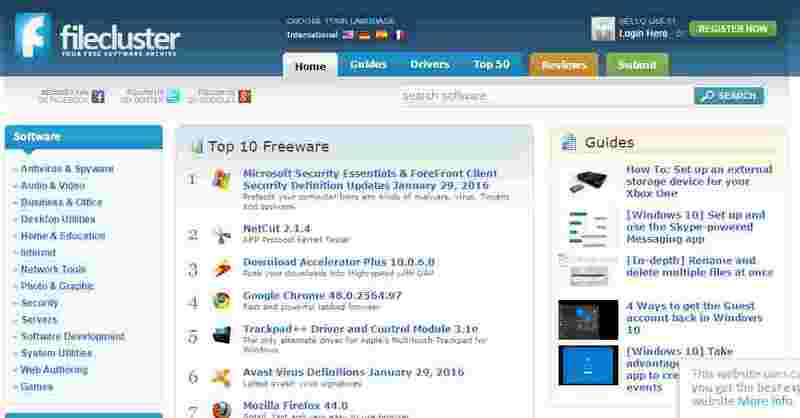 As the name suggests, Freewarefiles is a website that offers free software. It also features a list of open source softwares. It offers more than 15800 free softwares that you can download on their website. It is a well-organized site that lists all the programs into categories making it easier for you to find the one you want to download. 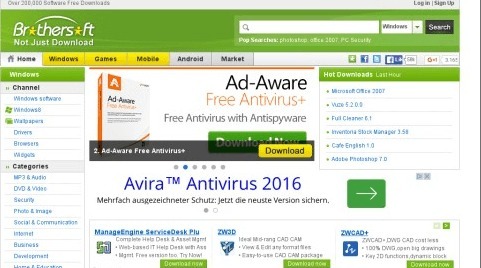 From Antivirus, games to audios and even videos the website lists all kinds of software. Launched in 1997 SnapFiles is one of the other websites that has been into the business for quite some-time and is equally popular as the other best software download sites in the category. It was earlier named as WebAttack and features a wide range of software programs to be downloaded. The name change has been a smart move considering WebAttack sounded something really to be weary of! You can still access WebAttack.com that redirects you to SnapFiles where you can download programs from direct download links from external source. It also allows you to list your software on the website. SnapFiles features an easy to understand and easy to navigate interface for your convenience. Filehorse is among the most popular software download websites that offers you to download free programs for your Windows computer. It is categorized as the website that offers free programs for your Windows operating system. It has a neat interface that lists all the programs under clearly defined categories. The programs are marked in big colorful icons that make it easier and interesting for the users to look for the one and download easily. You can also download the latest software that’s listed under the “Latest Software Releases” section and also from the “Most Popular Downloads”. 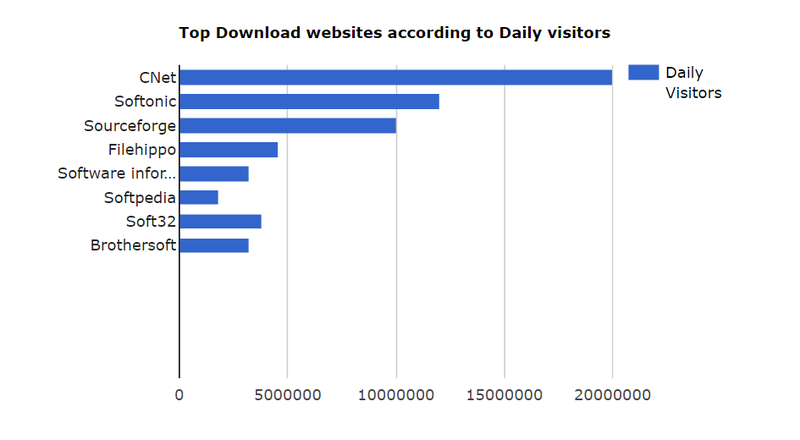 ZDNet Downloads houses the largest collection of software downloads that covers software for most of the platforms. If you are looking for technical softwares, then there is no better place than the software directory of this website. 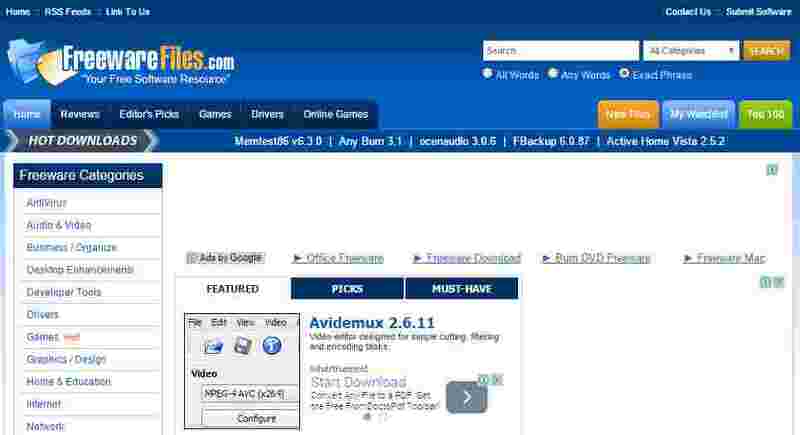 ZDNet showcases both freeware and shareware downloads. It is an easy to use website that categorizes the content for the better understanding of the users. It allows you to narrow down your search by your requirement such as, by price, free, free to try and purchase. Besides, you can also search your free software based on the category. FileCluster belongs to the newer generation of the software download websites. Functional since 2006, it provides recent and updated software programs to its users. You can get both freeware and shareware to download on the website. 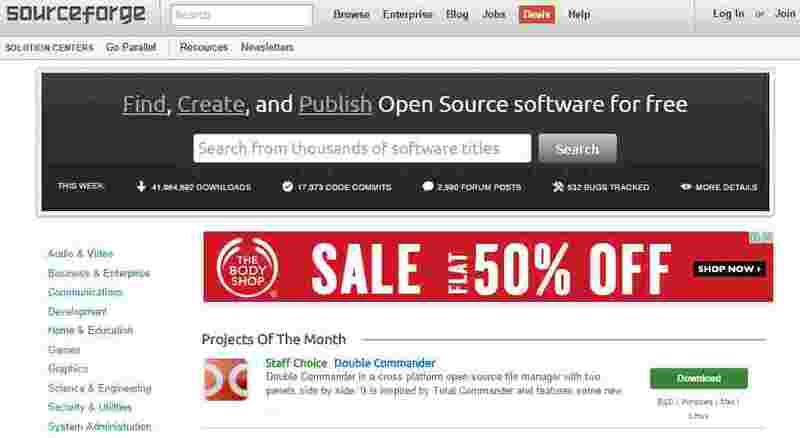 FileCluster also features collection of themes for WordPress and recent news about Software Organizations. 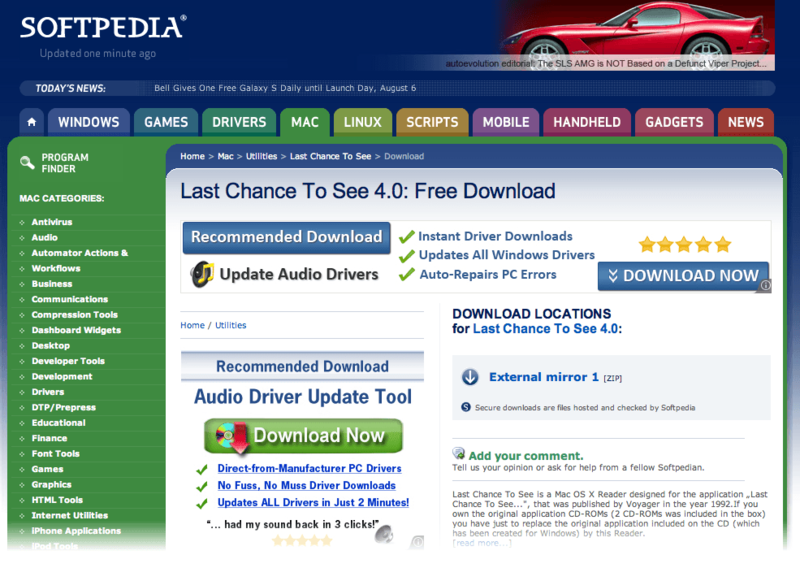 Established in 2001, Freedownloadcenter.com is another software download site that comes with an old styled interface. This site offers both free software programs and sharewares that you can download according to your requirement. The interface is pretty simple and the programs are categorized properly for you to identify the desired software easily and then download. If your PC runs on Windows or Mac operating system, Download3000 is just the right place where you can get most of your desired free software programs. The best part is that you can also view any software reviews before you download them, and also gadget reviews which is an add-on. You can search your software based on categories, refer to the top downloads or even view any related news or updates. You can download free software from most of the categories. Tucows is another veteran website that was established in 1994 and has been popular since its inception. 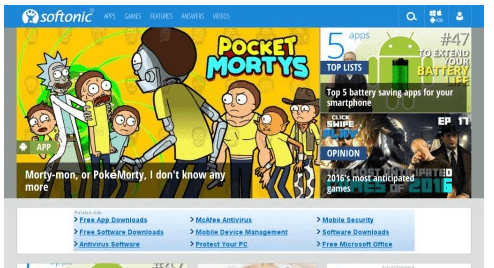 The site offers software downloads most of which are free for desktop computers and as well as for the mobile or tablet platforms. It is the first ICANN certified domain registrar. You can download a freeware or shareware from its wide collection, while the downloads are extremely secure with no malwares or viruses attached. As the name suggests, Open Source Mac features a simple collection of open-source softwares for the Mac OS X. 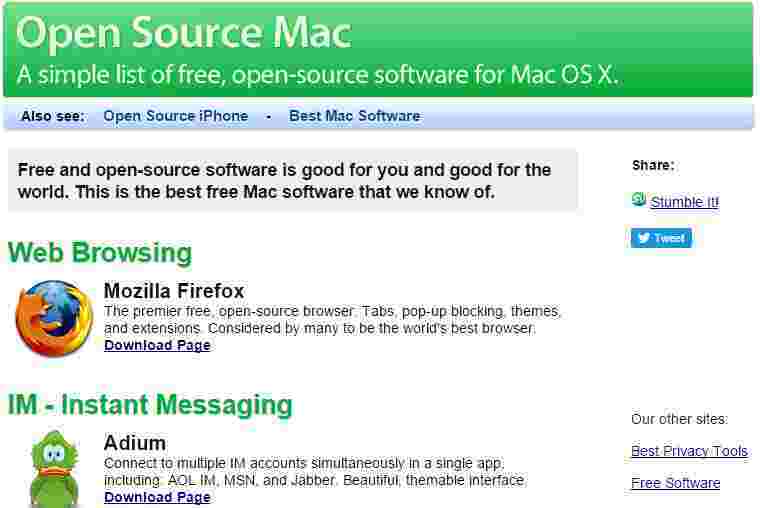 While most of the software download websites focus chiefly on the Windows OS, Open Source Mac offers the best collection of open source and free software for those who have Mac OS X. The best part about this website is that, it does not focus on listing any or all open source software, but rather offers the top websites that have the best features, easy to navigate and most important. Open Source iPhone Software is a website that lists the best open source softwares for your iPhone. So, as it claims that even if the iPhone OS may be idle or non-functional, free and open source software will still continue to function. From publishing, reference, music, and games to entertainment, utilities, iPhone hacks and developers you have free and open source iPhone software for almost all categories in the list.